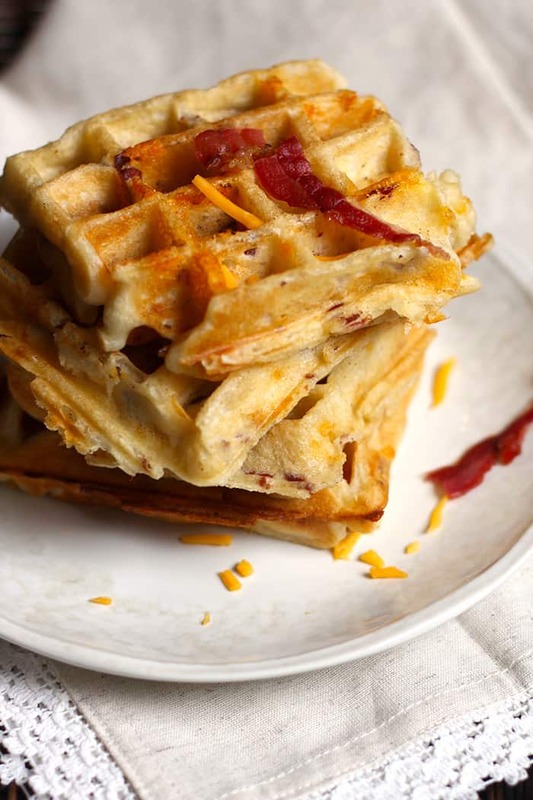 Bacon Cheddar Waffles are the perfect mash-up of sweet and savory. 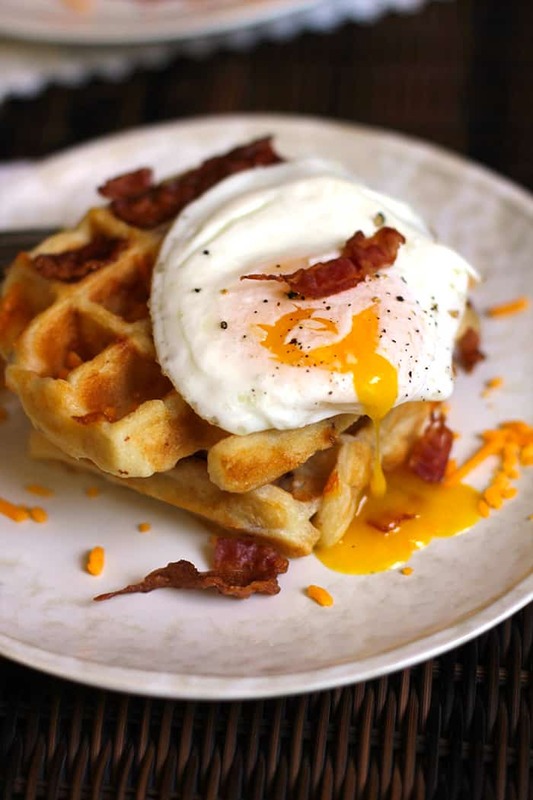 A buttermilk waffle with bacon and cheddar cheese mix-ins, topped with an egg cooked over-easy, and a big drizzle of maple syrup. Ahhhhh! This recipe was created with my youngest son in mind. Zach is a huge pancake/waffle/bacon/egg lover, and he always goes “heavy on the syrup”. I’ve recently cut way back on my breakfast for dinner meals, mostly because we are trying to get more seafood and veggies in the rotation. But every once in awhile, I have to sneak one of these types of meals in for good measure. Zach was over the moon when I plopped this in front of him (and his friend who is a girl) today. 🙂 He’s in luck, because I took the remaining waffles and froze them. So he can enjoy Cheddar Bacon Waffles any old time he wants. This recipe reminds me of the Chicken and Waffle craze that has hit the USA as of late. Our family enjoyed a round of these at a local restaurant recently, and we licked the plates. Instead of the fried chicken, my Bacon Cheddar Waffles include cheddar cheese, bacon, and an egg over-easy. You could eat the waffles plain, with a dollop of butter and syrup, but the BEST way to enjoy them is to top them with an egg and some syrup. When that sweet and savory taste hits the back of your mouth, you will sway. Literally. I’m always looking for meals that are freezer friendly, so the kids can just grab something and go. Waffles freeze up great, and I’ve been doing that for years. You just place them in freezer bags, separated by parchment paper, and freeze up to three months. Grab one on your way out the door, or eat them at home with a freshly cooked egg on top. Trust me, you’re gonna love this! 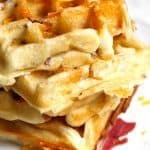 Please let me know if you try these Bacon Cheddar Waffles, and how you like them! I’m also sharing tidbits of my life on Instagram. ???? In a large mixing bowl, combine the eggs, vanilla, buttermilk, and canola oil. In another mixing bowl, combine the dry ingredients - the flour, baking soda, baking powder, salt, and sugar. Pour the dry ingredients into the wet, and stir until just combined. Cook the bacon, and crumble it. Add the bacon and shredded cheese to the batter. Stir to combine. Prepare a waffle iron. When hot, add batter and cook until done. You should get approximately 10 waffles. 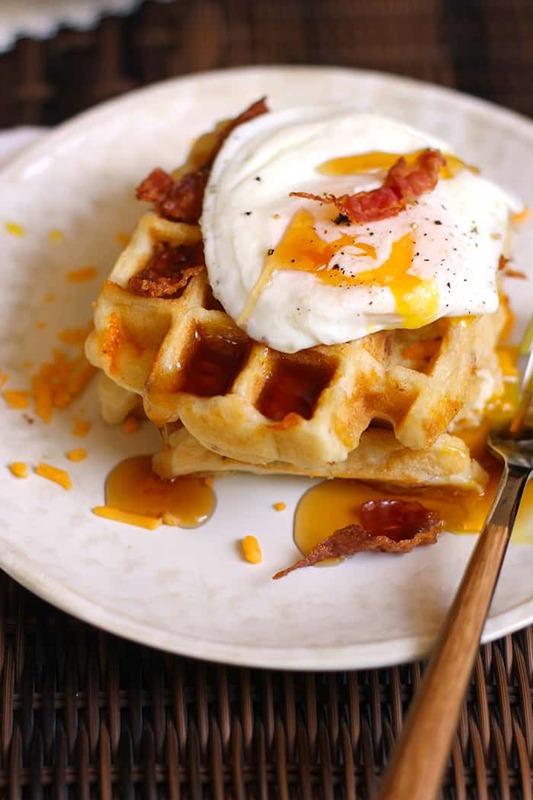 Serve by topping the waffles with an egg over easy, a few extra pieces of bacon, along with a big drizzle of maple syrup! 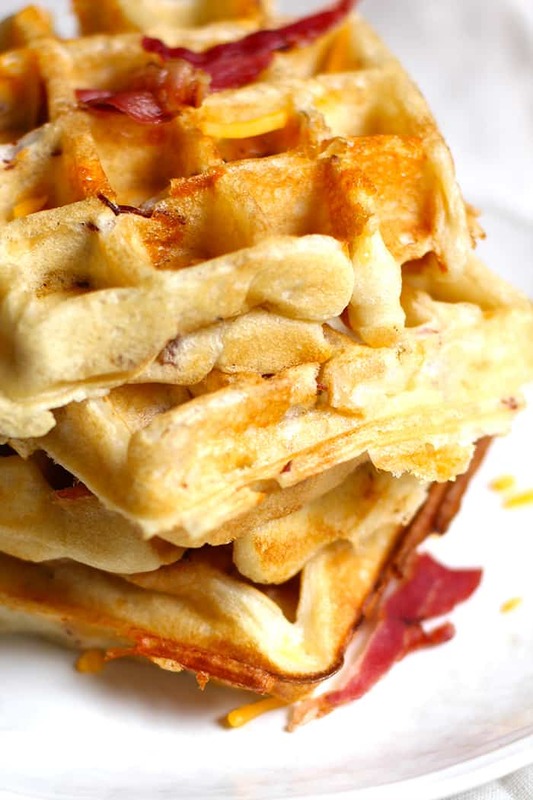 What can go wrong with a title that contains 🥓, Cheddar and Waffles! Seriously, this is a great weekend breakfast! Try it and you will not be disappointed.